My work is influenced by everything equine or equestrian: the symbolism, power, history, and beauty connected to the horse and all that encompasses it. Something worth doing deserves to be done excellently. Horses have been recognized for their noble and valiant character for centuries, and the progression of civilizations depended substantially on the quality of their horses. I love how the horse personifies the contrast of steel and velvet because even though it is strong and powerful, it also possesses a gentle and soft nature. I never tire of learning about them in every way you can think of. I find that assessing the horse through direct and indirect observation helps me to capture the best representations of it, whether I'm on the ground, riding, or reading. These animals are so multifaceted and I am to search out the whys and hows in my work. Why are we drawn to them, why are they so majestic, how do they work mechanically and mentally? So many questions with even more answers than one could come up with. A few renown equine artists of the past that inspire me are George Stubbs, Theodore Gericault, Sir Alfred Munnings, and Rosa Bonheur. Integrating the spirit and style of these artists with my own helps me form a contemporary look where I can merge my respect for traditional ideas with my own ways of expression. Several key principles that embody my work are Beauty, Form Rendered, Intentionality, Color Theory, and Scale. Another key element to my work is the faith I have in my Lord Jesus and a major foundational influence of my work: the values, feelings, change, and gratitude I have experienced through knowing Him reflects in my process and finished pieces. I think it just sort of happens.. and I am continually drawn back to where I find my identity in Him. My passion for art and adoration of the horse broken down in the fullest sense points straight to my gratitude and awe of what He has done, in how He has purposed me to create as He first created. Julie Ferris grew up in the Atlanta, Georgia area and moved to Savannah, Georgia in 2008 to attend the Savannah College of Art and Design. She received her BFA from SCAD and competed on the IHSA SCAD Equestrian team throughout her college career. She knew going into school that she wanted to ultimately pursue a career as an equestrian artist. With a major in Painting and a minor in Equine Studies, she set out to fulfill her dream in 2013 by starting her art business specializing in equine portraiture and other equine inspired works. Julie moved back to her hometown of Atlanta after living in Savannah for 8 years and is actively pursuing her career as an equestrian artist in her new location, currently painting at a studio above a barn! Last fall she participated in her first solo exhibit including a body of ten works titled EQ: The Aesthetic Response. In September 2016 she will put on her second solo exhibit titled The Art Horse: Series I at The Grand Bohemian Gallery in Savannah. Some of the original models for her paintings are the lovely horses owned by SCAD that she spent so much time with while pursuing her degree, as well as other horses she has encountered over the years and in her travels. As an equestrian artist, she finds it highly important to continue her professional development by both riding and painting as often as possible. Staying in tune with the horse industry and the art world helps her appeal to both the equestrian and the art collector. 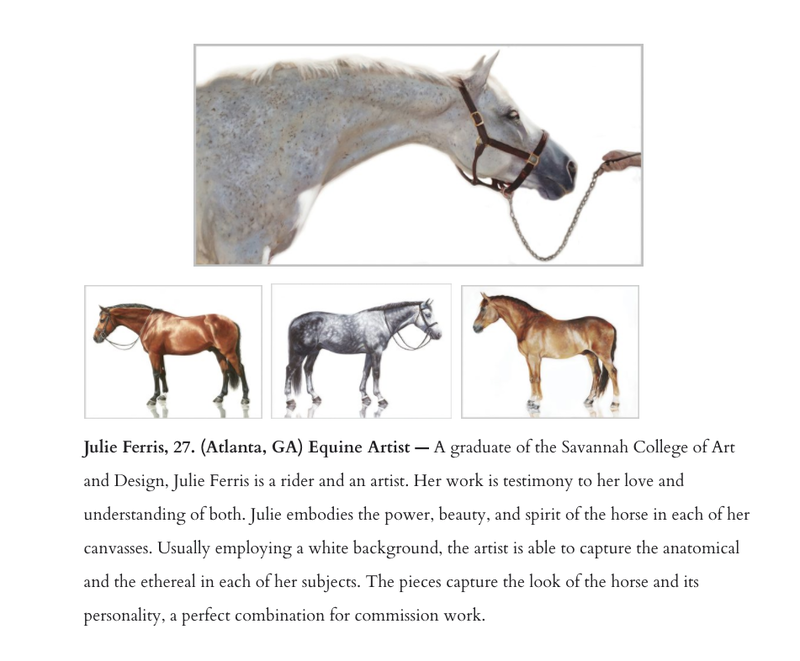 Julie strives for excellence in all of her work and continues to push the boundaries of the horse in art so that this incredible animal is exquisitely portrayed in all her depictions of it. She hopes, after experiencing her work, people will develop a newfound or deeper respect for the horse and equestrian art as a whole.